For too long have toilet seat designs remained stagnant. Sure, there are ones with cushions, some that don’t slam, and whatever the Numi has, but I’m talking about real innovation. Something that will push the envelope. Something that will alter our bathroom experience forever. Well I think that next great leap is here. I present to you the Bog Standard: the toilet seat you’ll tell your grandchildren about. Look at it in all its glory. The toilet paper is consolidated onto the actual seat! Saving you space and time! (Einstein would love this.) Before you ask, no, unfortunately you cannot buy one of these at SupplyHouse.com or anywhere. 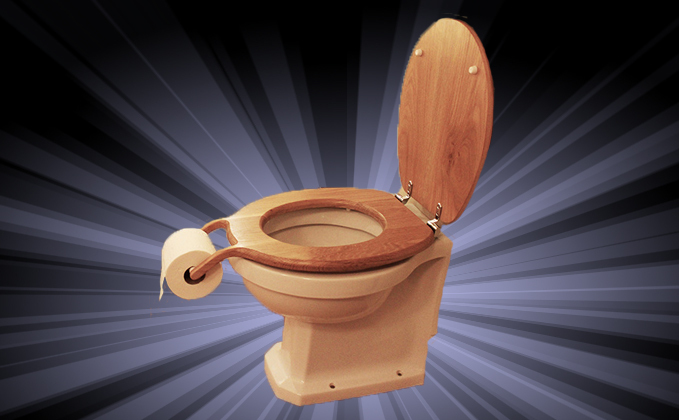 You won’t be able to deck out every toilet you use with the Bog Standard, because it isn’t for sale. Why is that? No, it’s not being reserved for only society’s most wealthy elites. You can’t buy one because it’s all a joke. A British designer, Henry Franks, made this as part of a research project on how the mechanics of humor (or “humour” as he spells it) can be used to improve everyday objects. Basically he thought it would be funny. You can check out his entire Humour in Design series here. So sure, it’s not a real product, but they say that all jokes are based off truth and I say there’s some serious truth going on in this joke.